The Old Tuam Society is delighted welcome back historian Damien Quinn for our first lecture of the 2016-17 season. 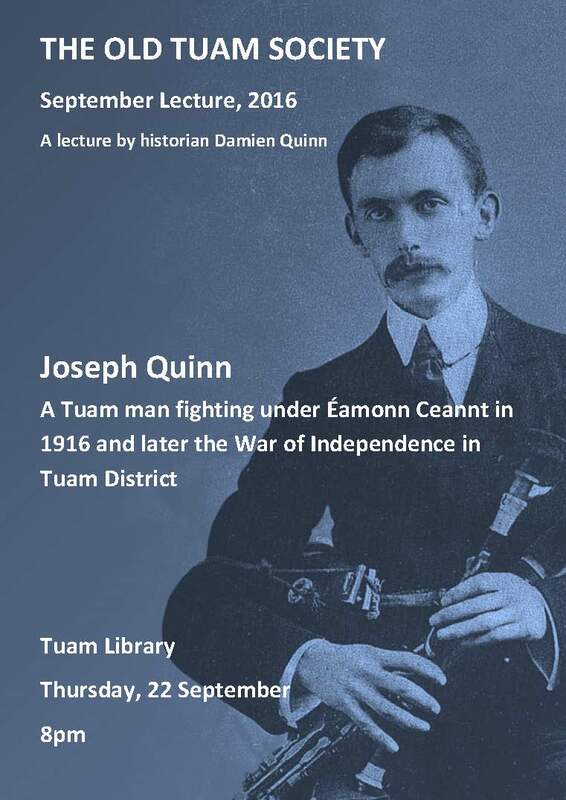 Damien’s talk centres on his great-grandfather Joseph Quinn, a Tuam man who found himself in the 4th Battalion Dublin Brigade under the command of Éamonn Ceannt in Dublin 1916 and later fighting in the countryside around Tuam during the War of Independence 1919-1921. Damien’s area of specialist research is Irishmen who served in the British Army and he previously delivered a excellent lecture to the Society on this theme in March 2013. Damien’s M. Litt, entitled ‘The Connaught Rangers and the Wars of Empire 1793-1922’ is a survey of one Irish regiment’s experience and involvement in imperial conflicts. In addition, Damien was invited to guest curate ‘Galway and The Wars of Empire’ for the Galway City Museum which examines the involvement of Galway men and women in the Wars of Empire between 1796 and 1922. Damien is currently editing The Connaught Rangers and the Wars of Empire 1793-1922 for publication. His previous publications include “Galway War Dead 1914 – 1918” (Jan. 2015) and he founded ‘Military History Ireland – A Research Resource’ on the men and women of Ireland who served in national and international conflicts.